Taylor Wilson built a functioning device that can detect nuclear weapons smuggled in cargo containers. He's 17. It works via a nuclear fusion reactor that he also built. When he was 14. 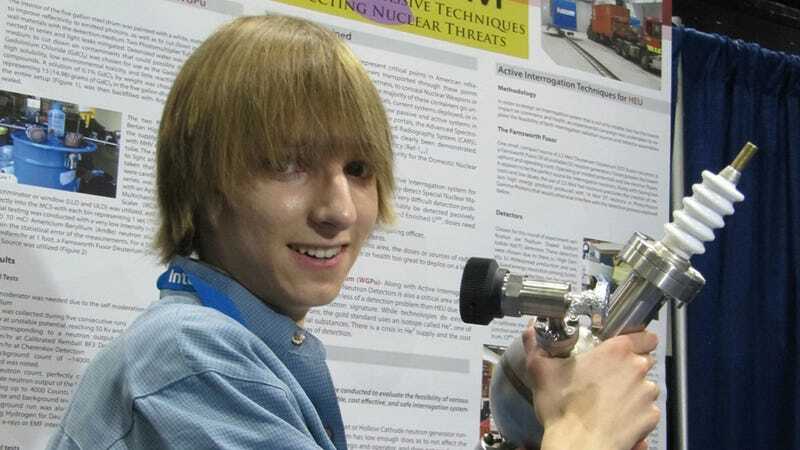 Taylor Wilson was just honored at the Intel International Science Fair for his project, which he's dubbed "Countering Nuclear Terrorism." It's a scanner that can automatically check to see if a cargo container might have a nuclear bomb hidden inside. Today that has to be done manually, and given the scope of how many containers come into the country, that essentially means most aren't checked. Wilson wants to solve that. [B]asically how it works is it fuses together heavy hydrogen – deuterium. And when these deuterium atoms fuse together, they give off neutrons. It's that neutron radiation that goes into the cargo container, and depending on what the makeup of the cargo container is, it will react in such a way that it gives off radiation. I detect that radiation and it's specific to whatever that cargo container's contents are. Some people may not go into science because they think, just nerds go into science, or science isn't cool. But the thing is, science is cool, and me and my friends who do science are cooler than the people who don't. So, I really think that science is a cool thing and if you really want to change the world, go into science. Because that's the future and that's who will really change the world.